It's no secret that I'm from the South, Texas to be exact. Things are different in the South. Things are more relaxed. Strangers drive through the country and wave at other strangers. We say y'all (you all). We say yes ma'am and yes, sir. We drink sweet tea. And we do food a lot differently too. Sure, I think I have sophisticated enough taste in food to explore different cuisines and different techniques. But, every now and again, I go back to my roots and want some good ol' down home food. One such Southern dish is Smothered Pork Chops. And there's probably as many recipes for it as there are Southern folks in church on Sunday. But it's usually pork chops smothered with an onion gravy. And it's pretty darn good, if you ask me. I had to throw in mushrooms just 'cause I really like mushrooms. But it was good that way and I think you'll enjoy it too! Whisk the dredge ingredients together. Heat a large skillet (one with a lid) to medium high heat. Melt the butter in the skillet and drizzle in some olive oil. Dredge the pork chops in the flour mixture and brown the chops in the butter, a couple minutes each side. (They won't be done.) Remove them to a plate and cover. Drizzle in some more olive oil, if necessary. Cook the onions and mushrooms until tender. Stir in the 1/4 C flour. Add in the chicken stock and whisk. Whisk in the half and half. Add the pork chops back to the pan and cover. Bring the mixture to a slight bubble and then reduce the heat to medium. Cook until the chops are done, about 15 to 20 minutes. This truly really isn't much of a recipe, but my family raved on so much about it that I had to share it! Cook the pasta according to directions. Drain and return the pasta to the hot pot. Stir in the remaining ingredients until cheese melts. So I was digging through old cookbooks for inspiration when I came across this recipe for Monterey Jack & Spinach Toasts in an old Pampered Chef cookbook. These were out of this world! I did change the recipe slightly, just because I can't leave things alone! But these are easy and crowd pleasing! Preheat the oven to 375 degrees. Whisk together the sour cream, mayo, and garlic powder. Stir in the spinach. Lay the bread slices out on a sheet pan. Spread this mixture on top of all of your bread slices. Lay two slices of cheese over the top. Bake for about 10-12 minutes or until the spinach mixture is hot and cheese on top is browned. If you know me, you know I like to wrap food in food or stuff food in food. It's kind of a habit. It's just so fun to bite into a little package and have a surprise inside. Now, I know I've done stuffed chicken parmesan before. But what about Mozzarella Stuffed Chicken Parmesan Meatballs! Let me tell you, these were so good that the four of us stood in the kitchen fighting over the little bits of Mozzarella that melted out of a few of these meatballs. You know, that cheese that gets browned and crusty on the pan? Yeah, that's the stuff. We all love browned cheese around here. So these meatballs are easy to put together and easy to cook. And no frying involved! You have an option here to buy chicken already ground, or you can do what I did and put a few chicken breasts in the food processor and grind them yourself. The way I did it was a little sticky, but I didn't mind. The end result was worth it. Serve these with some homemade Marinara sauce. Trust me, making your own sauce is easy and so much better than the stuff in a jar. It requires a little chopping and some simmering on the stove. My recipe for Marinara makes a lot, but it freezes really well in smaller containers. Preheat the oven to 350 degrees. Mix the chicken, egg, Parmesan, parsley, garlic, 2 T olive oil, onion, and salt & pepper together with your hands. Take about 2 T of the mixture and flatten it slightly. Place a cube of cheese on top and wrap the chicken around the cheese, forming it into a ball, making sure no cheese shows through. Place them on a sheet pan and drizzle them with olive oil. Bake for about 25-30 minutes or until the chicken is done through and browned. Serve with homemade Marinara (click for recipe). I made these Cheesy Cauliflower Tots not to fool my family into thinking they were potatoes, but because I had an abundance of cauliflower from my latest Bountiful Baskets purchase. And you know what? While they don't taste at all like tater tots, they were pretty darn good! Preheat the oven to 400 degrees. Boil the cauliflower until tender. Drain very well on a towel. Put the cauliflower in a bowl and mash very well with a fork. Stir in the remaining ingredients. Using your hands, roll and shape about 1 1/2 T of the mixture into tater tot shapes. Place them on a sheet pan and bake about 25 minutes or until firm and golden brown. 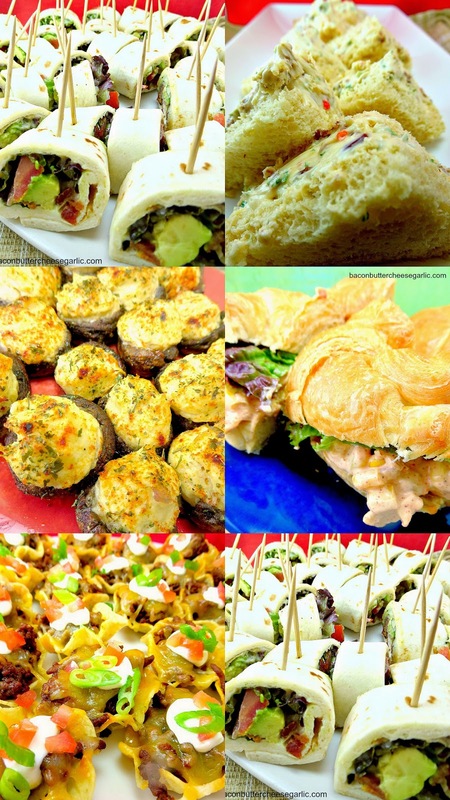 It's wedding season, and what better way to celebrate with a bride than some fabulous finger foods for her shower! This collection is full of easy and tasty recipes sure to please any wife to be! These little taco bites are easy and fast. And a huge hit! Brown the ground beef in a skillet and add in the taco seasoning and water according to the package directions. Preheat the broiler. Put a little meat in each Scoop chip and place on a sheet pan. Sprinkle each one with a little cheese. Melt under the broiler for about a minute. Put the sour cream in a pastry bag or a zipper bag with the corner cut off. Squeeze a small dot of sour cream on each mini taco. Garnish with a little bit of the tomatoes and green onions. Oh, my word. This is one of the best snack foods that have come from my kitchen in a long time. 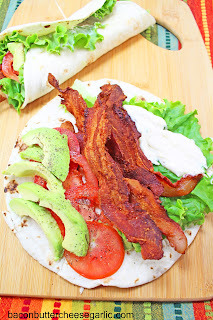 BLAT Wraps (bacon, lettuce, avocado & tomato) were a HUGE hit at both a wedding reception I helped with and at home when we made them again the very next weekend. These are fantastic! Mix the mayo with the garlic powder. Season the avocados and tomatoes with a little salt and pepper. To assemble, spread some of the mayo all over one side of a tortilla. Place a piece of lettuce on top of the mayo. Put some bacon, tomatoes, and avocados in a line down the center of the tortilla. Roll them up tightly. You can leave them as is or cut them into about 1-inch pinwheels and secure with a toothpick. Love finger sandwiches? These tasty little gems are filled with goat cheese, cream cheese, bacon, and pepper jelly. And they're darn tasty! Mix the cream cheese, goat cheese, parsley, and pepper jelly together in a food processor. Stir in the pecans and bacon. Divide the filling among five of the slices of bread. Top each with another slice of bread. Cut the crusts off and cut them diagonally both ways so each sandwich becomes four triangle sandwiches. To store these, line a plastic container with a paper towel and refrigerate. Like chicken salad but want a twist? Try this Southwestern Chicken Salad. Great on a croissant or even with tortilla chips! Whisk together the sour cream, mayo, lime juice, garlic powder, taco seasoning, and cilantro. Stir in the remaining ingredients and chill about 30 minutes. Serve on croissants. I have yet met a stuffed mushroom that I didn't like, and these are no exception! Crab & Cream Cheese Stuffed Mushrooms! They were so darn tasty and gone in a flash! Preheat the oven to 350 degrees. Remove the stems and the gills from the mushrooms and then brush the outsides of the mushrooms with a little olive oil. Mix the cream cheese, crab meat, Worcestershire, mustard, Italian parsley, salt and pepper, and Parmesan together in a food processor. Using a pastry bag or a zipper bag with the corner cut off, pipe the filling into each mushroom. As you can see in the picture, you can overfill them. Sprinkle each one with a little paprika and dried parsley. Place them in a casserole pan or a sheet pan and bake uncovered for about 30 minutes. I have a confession to make. There is one fast food place that I love the tacos from. I meant to say LOVE! I'm sure all of us have that one guilty pleasure from a fast food restaurant. It must be in our nature or something. Anyway, I love the tacos at Taco Cabana. (If you are not a Taco Cabana fan, I'm sorry. Please don't be mad at me.) I'm not sure what they put in the taco meat, but gosh it's good. When you pick up the taco, the juice runs down your arm as you eat it. I call Taco Cabana "Taco Heaven." I told you, I really do love those tacos. The little Pico de Gallo they put on them is pretty darn tasty too. So I set out to try to recreate these tacos. Now, while the tacos I made were pretty fabulous, it wasn't the exact same as Taco Cabana. But my family will attest to how good these tacos were. I used 2 pounds of ground beef, and my son ate all of the leftovers. For breakfast, lunch, and dinner. Must be good. 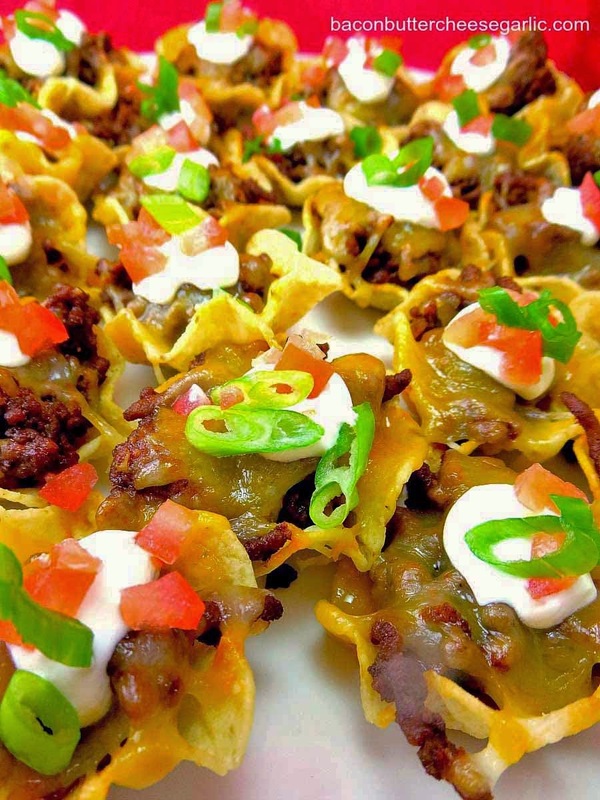 These are a little different than just cooking ground beef and throwing in some taco seasoning. You'll need to find what's called masa harina or corn flour, which is what is used to make corn tortillas. And a surprising ingredient in this is soy sauce. Interestingly enough, a lot of restaurants use soy sauce in Mexican food or in marinating steaks. It gives it a great flavor. Trust me. It works. And my Pico de Gallo? I could just sit and eat it with tortilla chips 'til I'm full. Darn tasty. Brown the ground beef in a skillet until done. Add in the remaining ingredients (cut the limes in half and squeeze over the meat.) Cook until most of the liquid is cooked out and thickened, about 8 to 10 minutes. Serve in warmed tortillas with shredded cheese and Pico de Gallo. **A trick for heating up flour tortillas quickly: Wrap them in a moderately damp towel and microwave for 1 minute. Rearrange them so that the middle tortillas are on the outsides and heat again for 1 minute. Mix the tomatoes, onion, cilantro, jalapenos, garlic, and cumin together in a bowl. Cut the limes in half and squeeze over the mixture and season with salt and pepper (taste it again to check for enough salt). Cover and put in the fridge until ready to use. Here's a recipe that I adapted from a very old Pampered Chef cookbook. It's Barbecue Potatoes. It takes no time at all to get ready, and the cook time is not too bad either, about 35-40 minutes. Long enough to finish cooking the rest of your meal. I caught my son eating the leftovers the next day for breakfast. Must have been good. Preheat the oven to 400 degrees. Spray or grease a sheet pan. Mix all of the ingredients together except the potatoes with a whisk in a large bowl. Add the potatoes to the bowl and toss to coat. Spread the potatoes in a single layer on the sheet pan. Bake for 35-40 minutes or until the potatoes are fork tender. Let's talk skillets. A skillet is one of the most important tools you have in your kitchen. Seriously. I have 4 skillets and use at least one of them every day. The two that I use most are a 13-inch stainless steel KitchenAid skillet and a 12-inch Lodge cast iron skillet. I love them both. My husband uses the cast iron more than the stainless steel because food just doesn't stick at all in it. Anywho, here's a dish I made in that said skillet. Chicken & Mushrooms with a Honey Mustard Cream Sauce. This was so delicious! Good thing I had that skillet. In a large skillet on medium high heat, melt the butter and drizzle in some olive oil. Dredge the chicken in the flour and place in the skillet. Brown the chicken on both sides in the skillet. Remove to a plate. (The chicken won't be done yet, but it gets cooked more.) Add the mushrooms, garlic, and onions to the same skillet and cook until tender (you may need to add a little more butter if the chicken absorbed too much). Deglaze the pan with the wine and cook to reduce. Add in the chicken stock, half & half, dijon, honey, and cheese mixture. Return the chicken to the skillet and lower the heat to medium low. Cover and let it simmer for about 15 minutes or until the sauce is thickened and the chicken is done through. Remove from the heat and stir in the parsley. Garnish with more cheese, if desired. This pizza was more for me than my husband, who is a traditionalist when it comes to pizza. I actually prefer pizzas that are anything but traditional. This pizza has cream cheese instead of sauce and it was full of flavor! Darn tasty! For the dough, mix the water, yeast, and sugar in the bowl of a stand mixer. Let sit about five minutes until frothy. Add in the flour, salt and olive oil. Beat with a dough hook until it forms a ball. Put the ball in a large greased bowl and cover. Let it sit for about an hour to rise. Cut the bacon into little strips and cook in a skillet. Slightly undercook the bacon since it will cook more on top of the pizza. Beat the cream cheese, Cheddar cheese, Parmesan cheese and garlic powder together either with a mixer or in a food processor. After the hour, on a floured board, roll the dough out to almost the size of the stone or sheet pan you're going to cook the pizza on. Transfer the dough to the stone or sheet pan. Carefully spread the cream cheese mixture onto the dough. Top with the bacon, onions, and Monterrey Jack cheese. Cover and let rise another 30 minutes. Preheat the oven to 400 degrees. Brush the edges of the pizza with the melted butter. Bake about 15 to 25 minutes or until the dough is done and the cheese is slightly browned. This is an interesting little treat. British in origin, these are also called Picnic Eggs, although I have labeled them as a breakfast item since we ate them for breakfast. It's a boiled egg that's wrapped in sausage, breaded, and deep fried. We were surprised at how tasty these were! Using your hands, pinch off pieces of sausage and wrap around each egg, making sure no egg shows through. Mix the raw eggs and some water together. Roll the egg around in the flour, then into the egg wash, then into the panko, making sure to completely coat the eggs. Fry them in the peanut oil heated at 350 degrees until well browned and the sausage is cooked through. Like sweet stuff for breakfast? Try these Jam & Cream Cheese Kolaches. The best part (besides how good they are) is you start the dough the night before baking! The night before baking, put the yeast and sugar into the bowl of a stand mixer. Melt the butter with the milk in a small pot. Let cool slightly. Whisk in the eggs and add it to the yeast mixture. Add in the flour and salt and mix with a dough hook until it forms a ball. Put the ball into a large greased bowl and cover. Let it rise about an hour. Put it in the refrigerator overnight. The day of baking, put the dough out on the counter for about 30 minutes. When it is less cool, turn it out onto a well floured board. Pat it with a little flour. Pinch golf ball sized pieces from the dough and roll them into balls. Place the balls on a sheet pan and use your thumb to indent the center. Let it rise for about 30 minutes in a warm place. Preheat the oven to 350 degrees. Mix the cream cheese, sugar and egg yolks together with a whisk or in a mixer. Divide the cream cheese filling equally and put spoonfuls into the indented centers of the kolaches. Add about a teaspoon of jam on top of the cream cheese. Mix the egg with a little water and brush the dough edges of the kolaches. Bake about 15 to 20 minutes or until the dough is done all the way through and the edges are browned. If you've ever been to the town named West, Texas, then you know all about the Czech Stop and their famous kolaches. I've stopped pretty much every time I've driven through there. And, if you go, expect to wait in line. If you don't want to wait and you are familiar with making yeast breads, here's a great recipe for you to try. These are Sausage & Jalapeno Kolaches. The bread on these turned out so surprisingly soft, and they were even good reheated the next day. You will want to buy the long smoked sausages that are smaller than hot dogs. If you can't find them, you can use Lil Smokies and just use two per kolache. My husband loves this Habanero Havarti cheese that we find in our deli, and it is perfect for these kolaches. And the dough can be made a day ahead and refrigerated. You're going to love these! The night before baking, mix the yeast and sugar in the bowl of a stand mixer. Meanwhile, melt the butter with the milk in a small pot. Remove from the heat and let cool slightly. Whisk in the eggs. Add the milk mixture to the yeast. Add in the flour and salt. Mix it together with a dough hook until it forms a ball. Put this mixture into a large greased bowl and let it rise about an hour. Put it in the refrigerator overnight. The next morning, set the dough out on the counter for at least 30 minutes. When it's not as cold to the touch, turn it out onto a well floured board. Roll the dough out (use more flour if necessary) to about 1/8 inch thick. Cut into 14 equal pieces. Lay a few jalapeno slices down the center lengthwise of each piece of dough. Sprinkle some Habanero Havarti down the center. Lay 1 (or 2) sausages down the center. Fold the sides of the dough over the filling. Place them seam side down on a sheet pan. Lay additional jalapeno slices on top, if desired. Let them rise about 30-45 minutes. Preheat the oven to 350 degrees. Whisk the egg with some water. Brush the tops of each kolache with the egg wash. Bake them about 20 minutes or until the dough is done all the way through and the tops are browned. Serve with mustard, if desired. My husband and children are huge fans of Asian food. If I ask my son what he wants for dinner, more times than not he'll say stir fry. He doesn't often get his wish, though, because I usually plan meals for at least a week and sometimes two weeks out. But, since I had an abundance of fresh veggies thanks to my most recent Bountiful Baskets purchase, I thought, why not. The kid loves veggies, and I'll take any opportunity I can get to keep him from eating sugar, which he loves more than veggies. So I've seen pictures of what's called Bibimbap. It's a Korean rice bowl that has sauteed veggies and usually thin strips of beef and chili paste and a fried egg on top. You serve it with all of the components separate, and the person eating it mixes it together when they eat it. Interesting concept. While there's a little bit more work involved because of the chopping and the separate cooking, we found this dish quite delicious. And it's totally customizable. You can cook all the parts, keep them separate, and everyone can pick and choose what goes on their bowl. My version uses chicken instead of beef, but it was still pretty darn tasty! Cook the rice according to directions. Set aside. Using one or two skillets, cook each vegetable separately with a clove or two of minced garlic in some olive oil and sesame oil. Season each veggie with soy sauce, as desired. Remove each vegetable and put in separate bowls, covering to keep warm. Once all the veggies are cooked, divide the rice among four bowls. Let each person pick their toppings and garnishes. Fry each egg to desired doneness and top each bowl with an egg. I usually only eat hot dogs about once a year. It's not that I don't like them, it's just one of those foods I have to crave. Plus I'm never really at a ballpark or the fair to get them. But lately I've had a craving for corndogs, or "Corny Dogs" as I've always called them. Since I don't buy frozen meals, I had to figure this one out myself. On the first batch we tried, the frank itself was cold and the batter was more like a tempura. I wanted a hot frank inside a thick cornbread-like batter. So we played with it, and we came up with a success. The trick to getting the franks plump and warm is to boil them and then leave them in the hot water until you're ready to batter. Then pat them dry and fry immediately. And the trick to the batter is a 2 to 1 ratio of cornmeal and flour, meaning twice as much cornmeal. The result? I loved them so much that I actually stole my son's last couple of bites of his last corndog. I know, I should be ashamed of myself. But it was THAT GOOD! Mix all of the batter ingredients together and set aside. Bring a large pot of water to boil and add in the hot dogs. Boil a couple of minutes to plump them up and then turn it off, leaving the hot dogs in the water. Preheat some peanut oil in a deep fryer or deep pot to 350 degrees. Remove a hot dog from the water and pat dry. Stick the skewer in one end and then dip the dog in the batter, rolling it around to coat. Put the corndog in the oil, holding it by the stick for a few seconds before releasing it all the way into the grease. Cook 3-4 minutes, turning over halfway through, until golden brown. Repeat for remaining corndogs. Here's another dish that's great for parties or get-togethers. Tortellini Salad with homemade Greek Dressing. Darn tasty! Cook tortellini according to directions. Drain and rinse. Mix dressing ingredients together in a blender. Mix all of the ingredients and dressing together with the tortellini. Chill at least 30 minutes before serving. Here is a tasty way to eat your veggies! 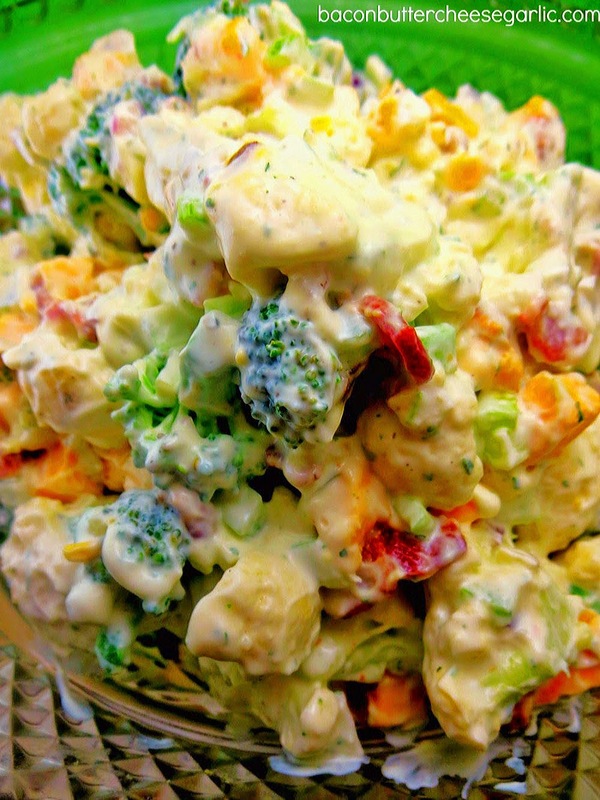 Raw broccoli and cauliflower with Cheddar cheese, bacon, celery, onions and Ranch dressing. Delish! And it's great for a potluck or BBQ! Mix the mayo, sour cream, and Ranch together with a whisk. Stir in the remaining ingredients and chill at least 30 minutes. Ever wanted a portable loaded baked potato or even portable mashed potatoes? Well, here they are. Loaded Potato Puffs are just that, loaded. Bacon, cheese, green onions, jalapenos, sour cream, butter, everything you want on a baked potato. They are crispy on the outside and soft on the inside. This recipe made 18 regular muffin size puffs, so you may want to cut the recipe in half if that's too much for you. Enjoy! Put the potatoes in a large pot and cover with water. Boil until fork tender. Drain. Preheat the oven to 400 degrees. Put the potatoes into a large bowl or a mixing bowl (I use my stand mixer) and mash the potatoes with the butter and cheese until cheese is melted. You want smooth potatoes. Stir in the remaining ingredients. Spoon the mixture into greased muffin tins, filling them up to the top. Bake for 25-35 minutes until they are set, slightly crispy on the outside, and browned. Serve with additional sour cream, if desired.